Schach DVD A dynamic weapon against the Queen’s Gambit Declined – 5.Bf4 | Videolektionen | Eröffnung | Training | ChessBase | Schachversand Huber - Spielen Sie eine Partie Schach ! Produktinformationen "Schach DVD A dynamic weapon against the Queen’s Gambit Declined – 5.Bf4"
This DVD concentrates on the increasingly popular 5.Bf4 variation of the Queen’s Gambit Declined and gives White a dynamic and aggressive weapon against Black’s set-up. White puts his bishop on f4 to avoid the exchanges that often occur after 5.Bg5 and as early as possible wants to put pressure on Black. At the highest level the variation with 5.Bf4 has become much more popular than the more traditional 5.Bg5 line. Top players such as Alexei Shirov, Vladimir Kramnik, Levon Aronian, Wesley So and Anish Giri play it, and Vishy Anand used it in his only victory over Carlsen in the 2014 World Chess Championship. This DVD recommends dynamic lines for White against all set-ups by Black and gives you a good, aggressive, and reliable weapon against the Queen’s Gambit Declined. Simon Williams became a IM in 1998 and a GM in 2008. For the last 15 years he has concentrated on teaching, playing and making instructional chess DVDs. His playing style is very aggressive, preferring attacking chess to positional grinds! He is the author of numerous chess books. His first chess book, ‘Play the Classical Dutch’ got voted, in New in Chess, as one of the top 10 chess books of all time. 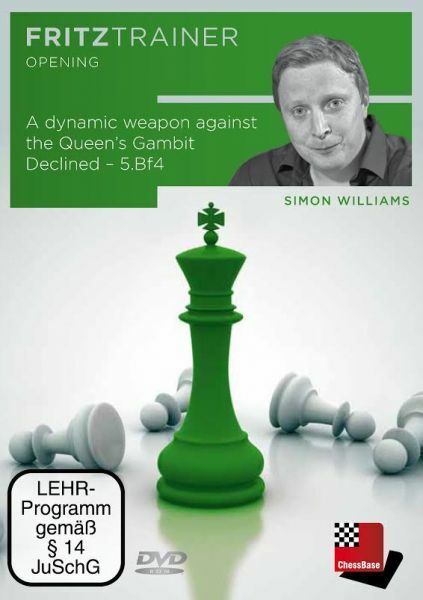 Kundenbewertungen für "Schach DVD A dynamic weapon against the Queen’s Gambit Declined – 5.Bf4"